On July 1st 2015, the World Data Center SILSO will lay an unprecedented milestone in the long history of the Sunspot Number. By its longevity, this reference sunspot record remains our unique direct reference retracing solar activity over more than 4 centuries and it is definitely the most widely used solar data set (more than 100 publications per year). However, this series was left unchanged since its creation by Rudolph Wolf in 1849, without any backward verification. The only innovation came in 1998 with the creation of a new similar sunspot index, the Group Number (Hoyt and Schatten 1998). However, the two parallel series showed strong differences hinting at strong inhomogeneities in either series or both. Since 2011, a group of 40 experts finally undertook a full revision of those two series in order to identify and fix the defects. 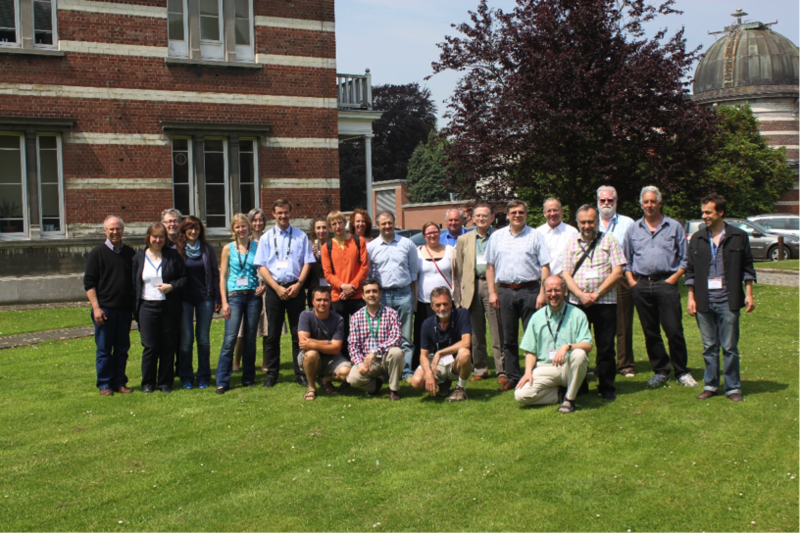 This huge work was co-organized by E. Cliver (NSO, Sacramento Peak Observatory), F. Clette (WDC-SILSO, STCE) and L. Svalgaard (Stanford University) around four successive workshops (one of them held at the Royal Observatory in Brussels in 2012 - See picture underneath). Now finally, all corrections have been finalized (for a recent synthesis, see Clette et al. 2014, Space Science Reviews). Over the last few months, all corrections obtained separately, often by different scientists, were finally assembled into a final end-to-end reconstruction of the Sunspot and Group Numbers. 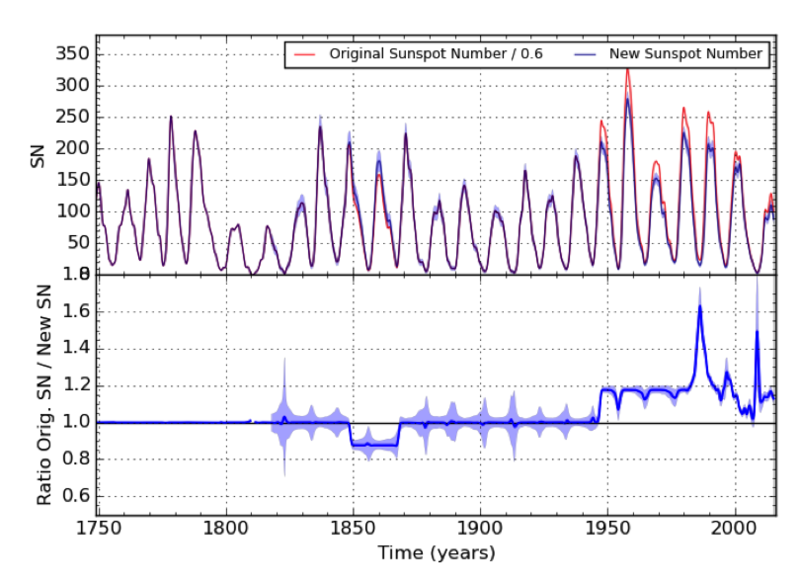 The figure below illustrates the change between the original and new Sunspot Number series. The most notable correction is a lowering by about 18% of all numbers after 1947, to remove the bias produced by a new counting method started in 1947 in Zürich. A large variable drift affecting the "Brussels-Locarno" Sunspot Number since 1981 has also been eliminated. Note that for the new Sunspot Number, the 0.6 conventional Zürich factor is not used anymore, which raises significantly the scale of the entire series. This simply reflects the choice of modern counts by A. Wolfer, Wolf's successor, as new reference. The new numbers thus now match much more closely the raw Wolf numbers obtained by all observers since 1993 until today. 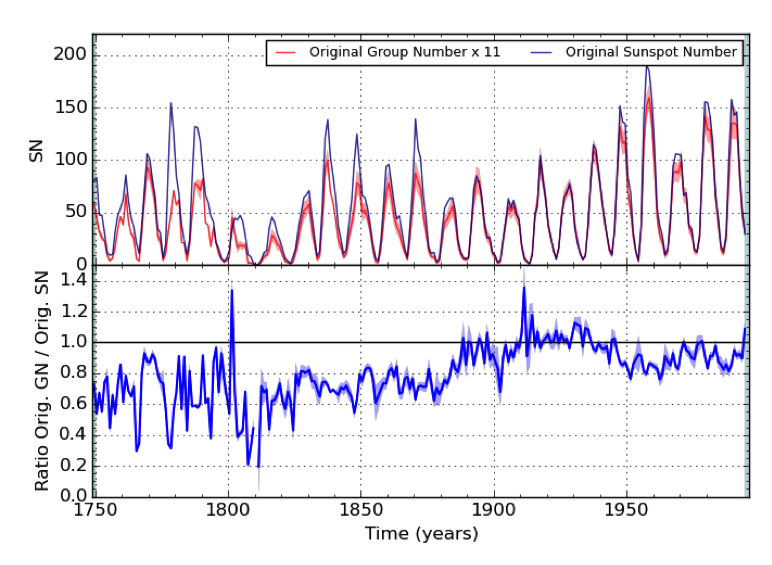 Independently, the Group Number was corrected for a large underestimate of all values before the 20th century (see figure below), due the instability of the reference data used by Hoyt and Schatten: namely the photographic data from the Royal Greenwich Observatory. 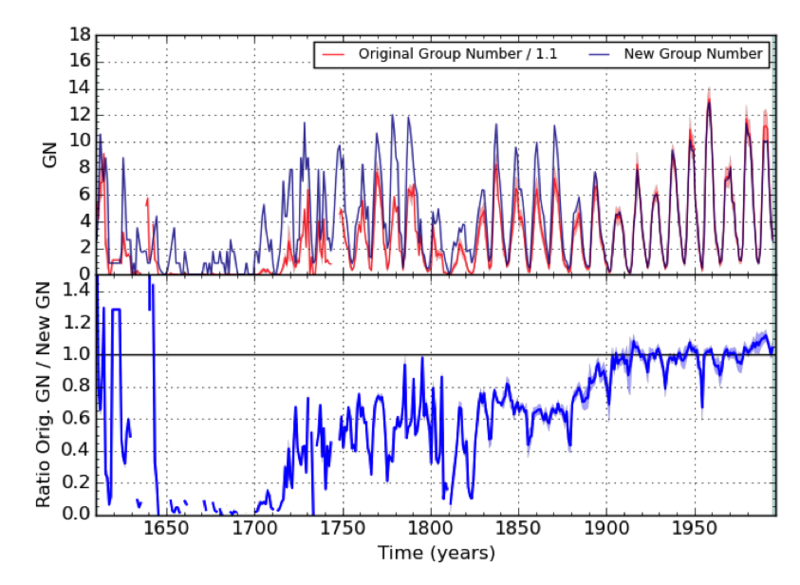 As a comprehensive database of all past group counts could be constructed, the new Group Number actually consists in a fully reconstructed series rather than a correction applied to original numbers. Now, finally, we can bring those two series together and observe the impact of the corrections on the original disagreements. 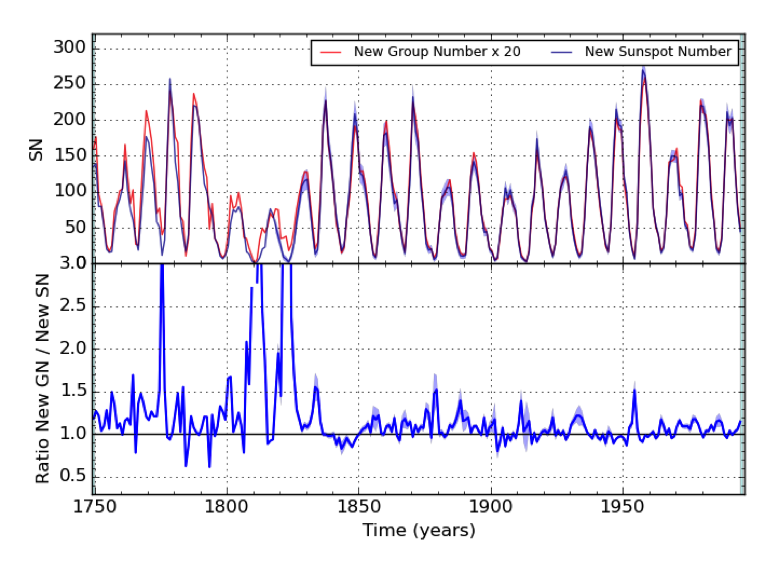 The two following figures show how the large disagreements characterizing the initial Sunspot Number and Group number series have now been strongly reduced. We must stress here that this improvement was not obtained by an ad-hoc mutual scaling between the series. On the contrary, as corrections were determined separately based on widely different data sets and techniques, the final agreement brings an additional confirmation of the validity of those corrections. 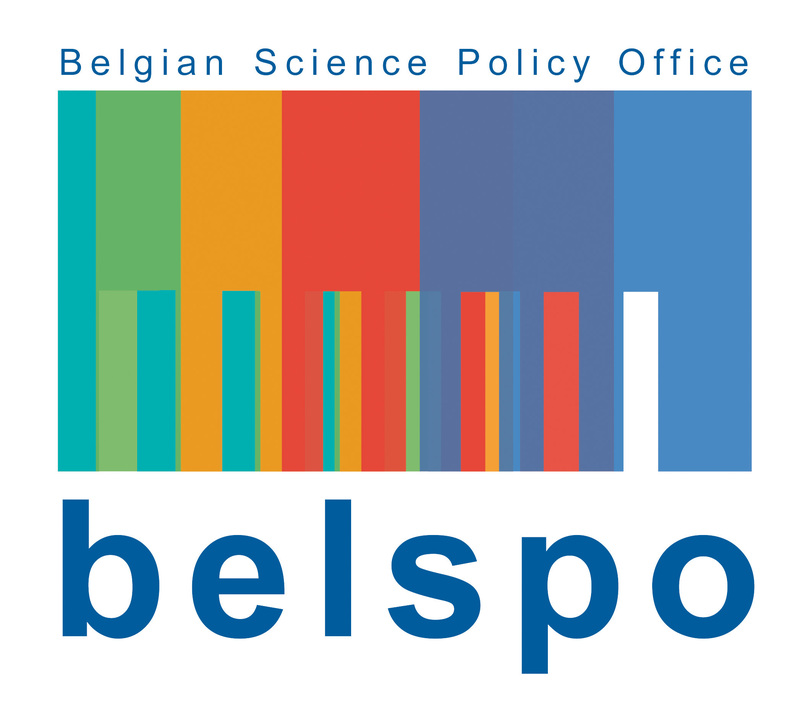 Moreover, as we now want to integrate a structured management of future versions of the Sunspot Number (under supervision of the International Astronomical Union), we had also to re-design the data section of our SILSO Web site. In parallel, we are also working on a thematic issue of the Solar Physics journal that will be entirely dedicated to the recalibration of the Sunspot Number (open to papers until the end of October 2015, in view of a publication in early 2016) and will fully document the present change. The last few weeks and last few days were thus particularly hectic for the SILSO team. We will do our best efforts to accomplish this major transition on July 1st with minimal disturbances for our users. However, given the number of simultaneous changes, the processing will probably be slower than usual to allow careful verifications. We thus ask our many users to be more patient on this occasion. As problems can never be excluded, we welcome any feedback about undetected issues.